You never know what you may find at the dollar store. 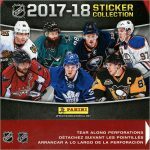 Recently, I found this “deal for a dollar”–a pack of NHL Original Six stickers, manufactured by Sandy Lion Sticker Designs. The pack of stickers contains two sheets, and each sheet has 15 stickers. You can use these stickers to decorate your notebooks, lunch boxes, lockers or party items such as invitations, paper cups or loot bags. 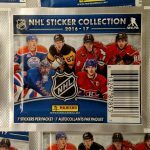 National Hockey League stickers are also fun to collect and trade with your friends. 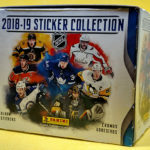 Looking at the NHL logo, these stickers must be pre-lockout, as it is the orange-and-black NHL shield, and not the newer, post-lockout silver-and-black NHL shield. It’s nice to see this stuff floating around. Here in the United States, you can always find baseball, football and basketball stuff without trying all that hard. 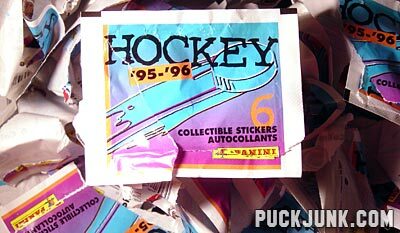 So I’m pretty stoked when I find something hockey like this in an out-of-the-way place.